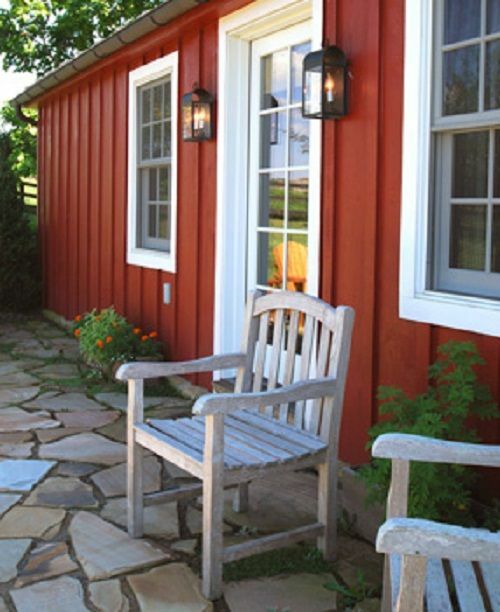 The Carriage House, Dutch Cottage, Spring House, French Farm Cottage, Manor House and Bull Barn Cottage. 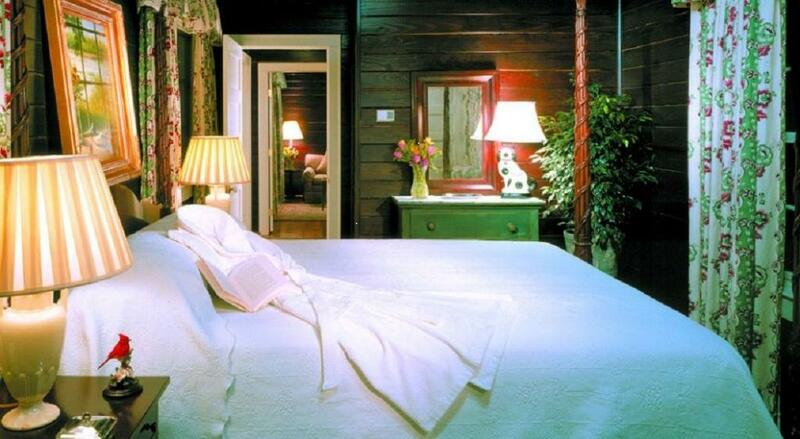 Guests may choose individual rooms or suites, or perhaps reserve the entire residence for their personal privacy. 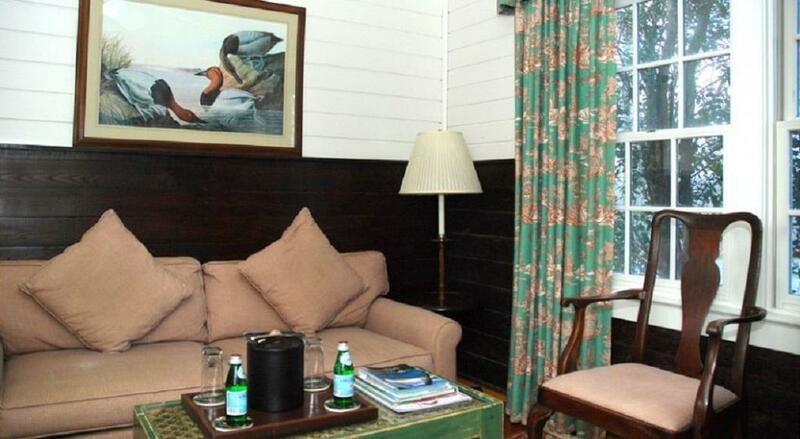 Additionally, the entire estate can also be reserved on an Exclusive Booking basis. 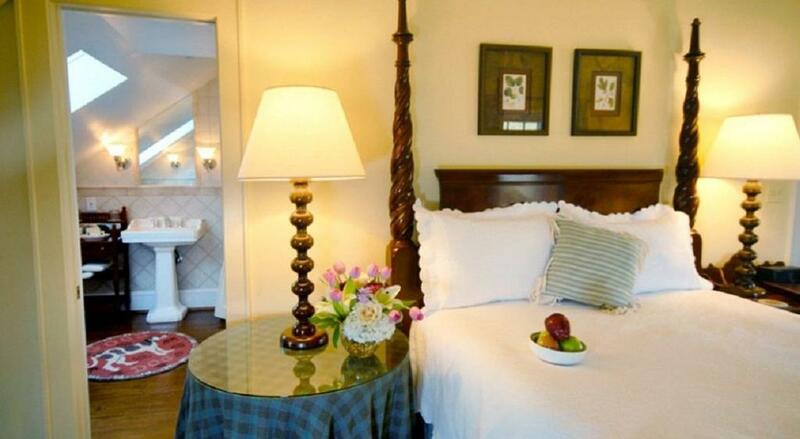 With its beautifully appointed, French Country décor, this romantic Carriage House suite offers a queen-sized poster bed, and lovely bath with combination jetted soaking tub and shower. 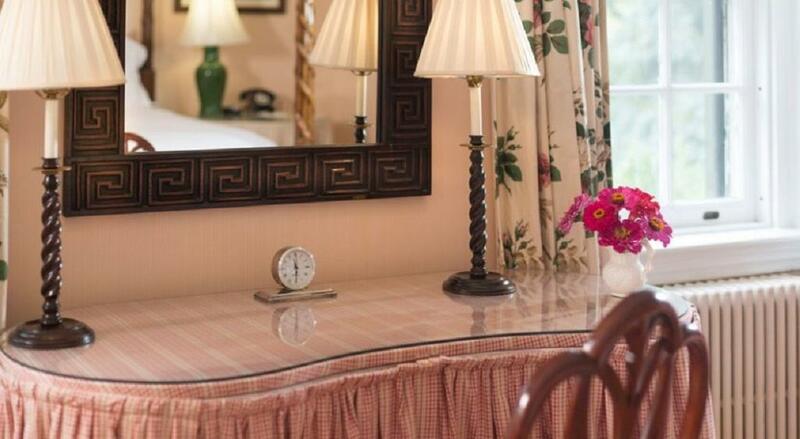 The Mare Suite features an inviting sitting room area with full size sofa bed, flat screen TV/DVD, CD player and refrigerator. 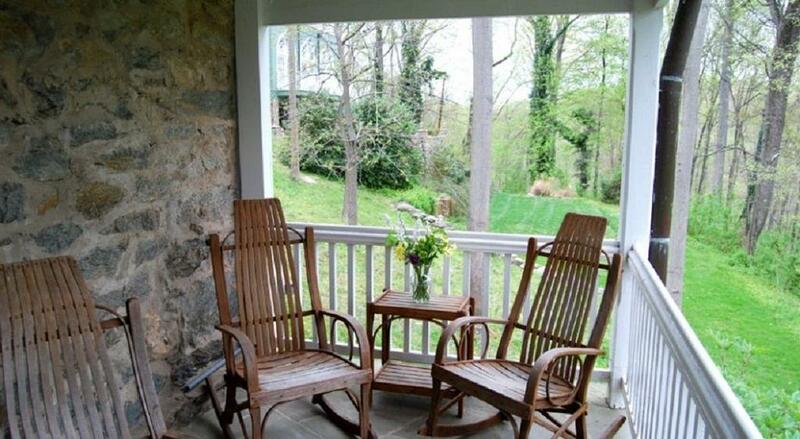 Enjoy enchanting views of the courtyard gardens and estate. 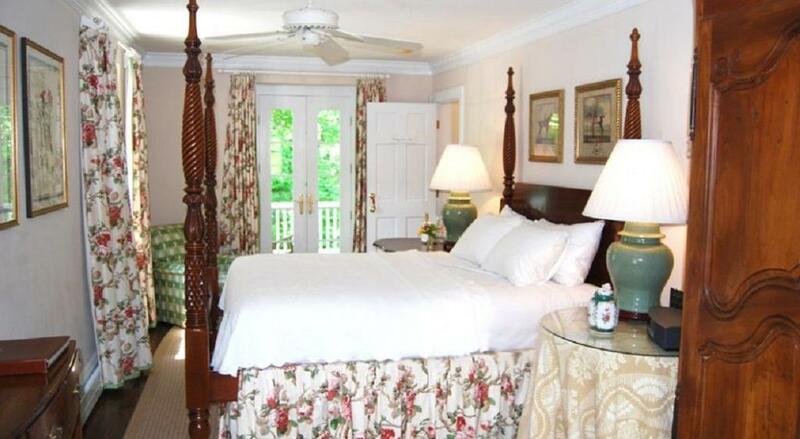 You may never want to leave our luxury Virginia inn! 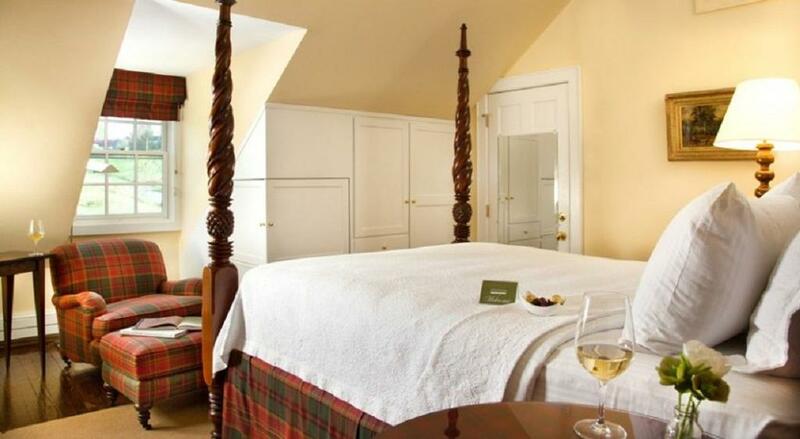 This attractive equestrian-themed suite is set in the historic Carriage House and features a plush king-sized poster bed and charming bath with combination jetted soaking tub and shower. 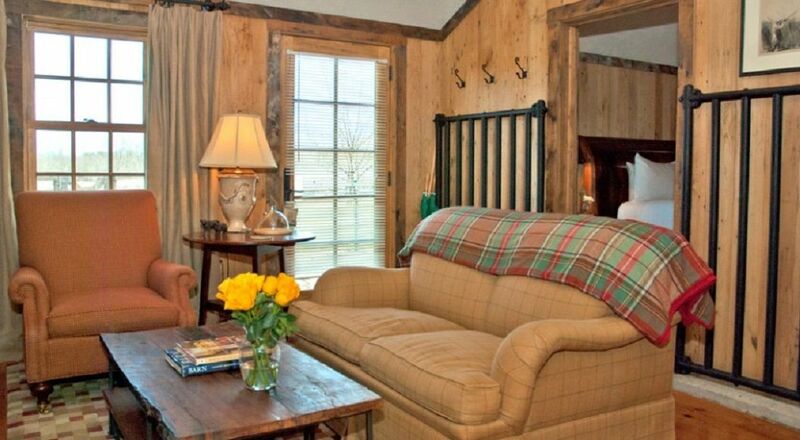 Enjoy a glass of fine Virginia wine or play a game of chess in the lovely sitting room, which includes a full size sofa bed, flat screen TV/DVD, stereo, CD player and refrigerator. 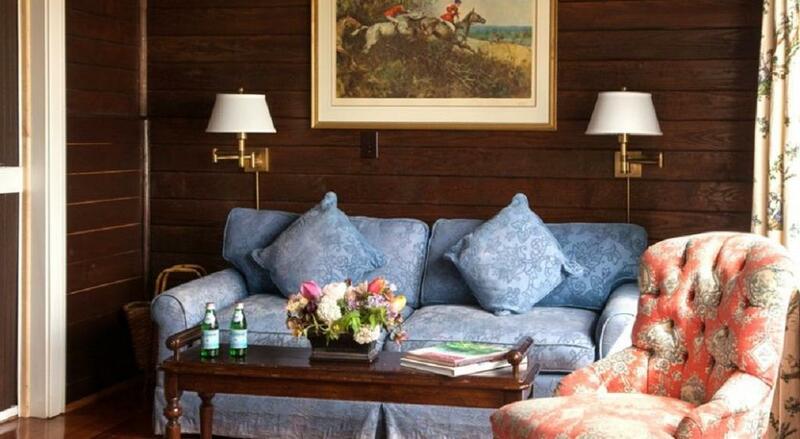 With views of Goose Creek, the Stallion Suite is a perfect respite at our VA country inn. 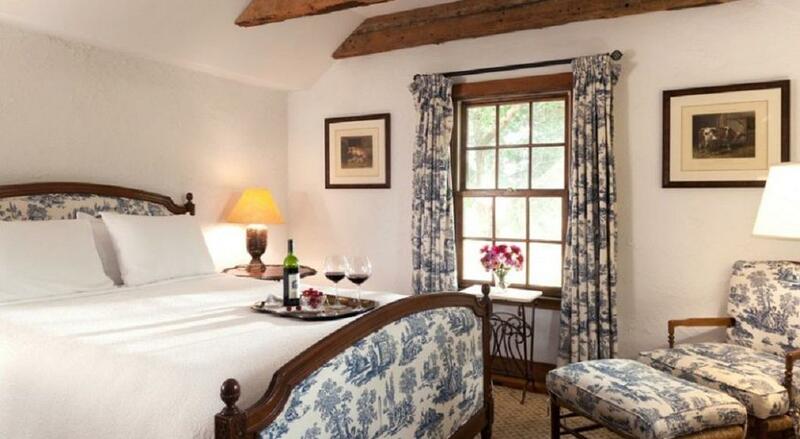 With its private entry via the Carriage House courtyard, this romantic suite at our Virginia bed and breakfast is ideal for a luxury getaway. 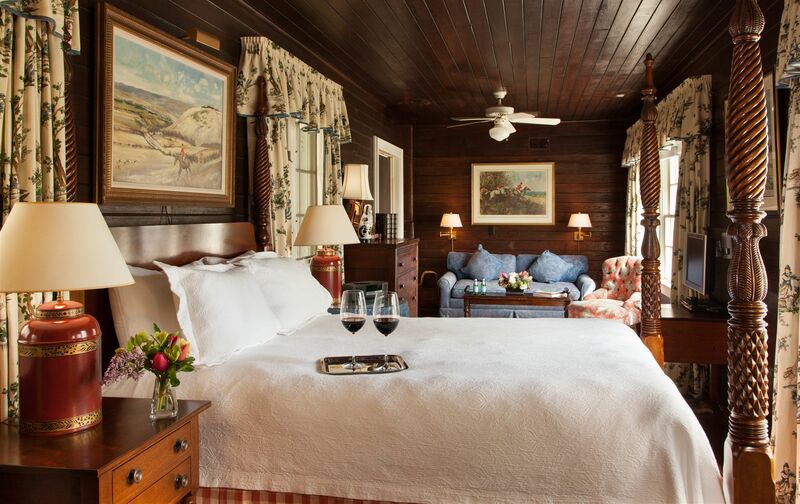 Set in an elegantly renovated stable wing, the Carlyle Junior Suite features a queen-sized bed, an inviting sitting area with full-size sofa bed, flat screen TV/DVD and private bath with claw-foot tub and combination shower. Relax in the sitting area with the morning’s copy of The Washington Post and a hot cup of coffee before you plan the day’s activities on the estate. 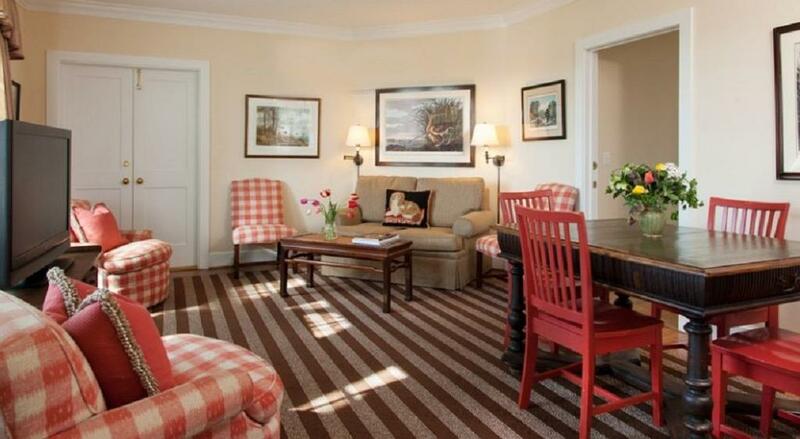 The suite offers exquisite views of the surrounding Blue Ridge Mountains and the Northern Virginia wine country. 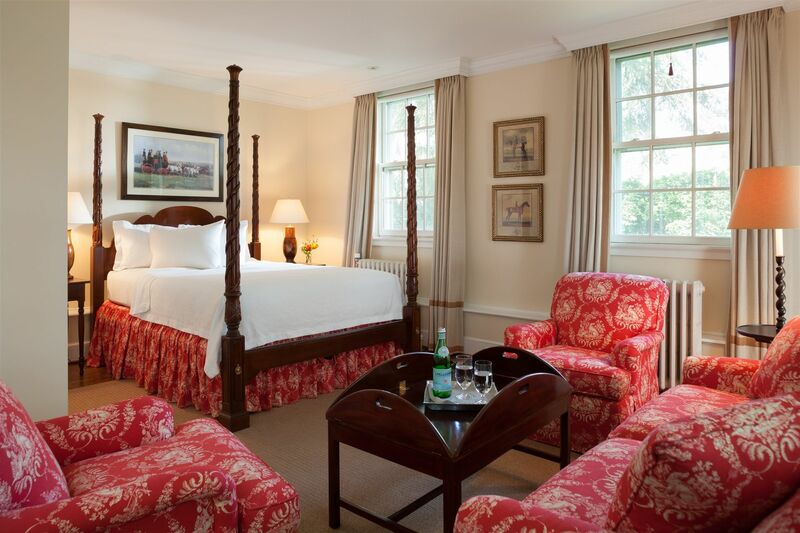 Stay at the Goodstone Inn & Restaurant in Middleburg, Virginia while enjoying one of our special packages. 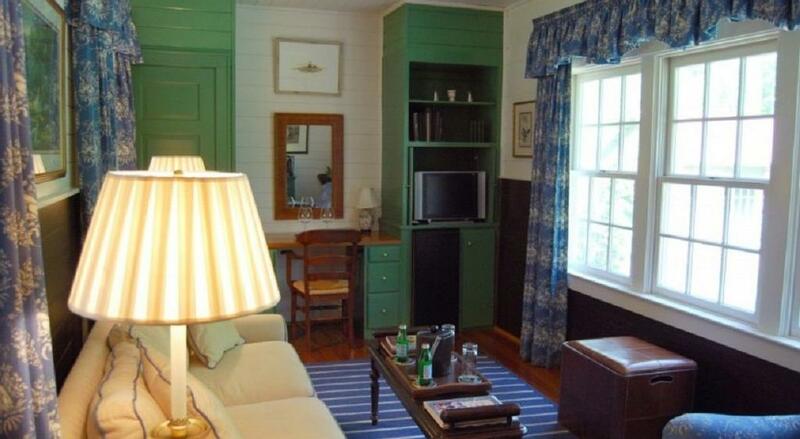 Pack your bags knowing you have it all. 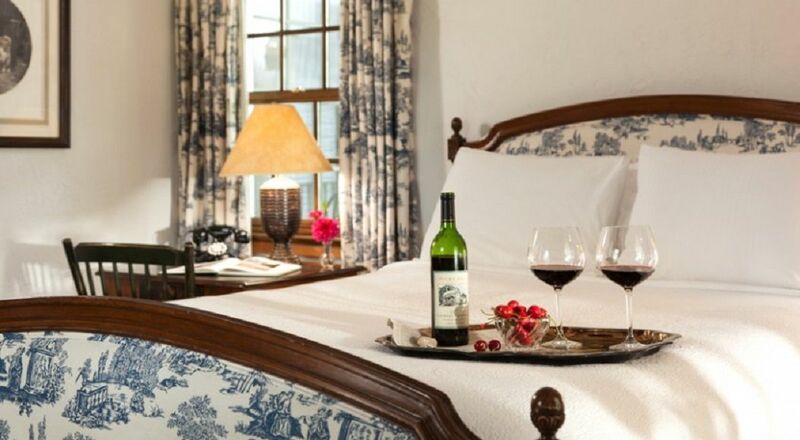 Our Romantic Getaway and Date Night packages let you experience the stay, dining and local area all at one price! Located on the second floor of the Carriage House, this dramatic guest room boasts an exquisite floor-to-ceiling pattern of blue and white toile that truly makes a statement! 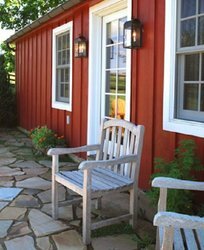 The Hayloft features a plush queen-sized bed, comfortable reading chair with ottoman, flat screen TV/DVD, stereo, CD player and refrigerator. 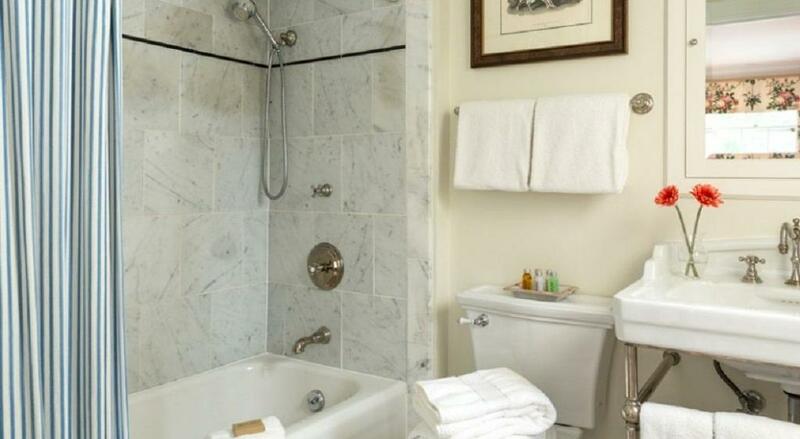 The room’s large bathroom includes an over-sized jetted soaking tub, separate walk-in shower with marble seating, and his-and-her sinks. 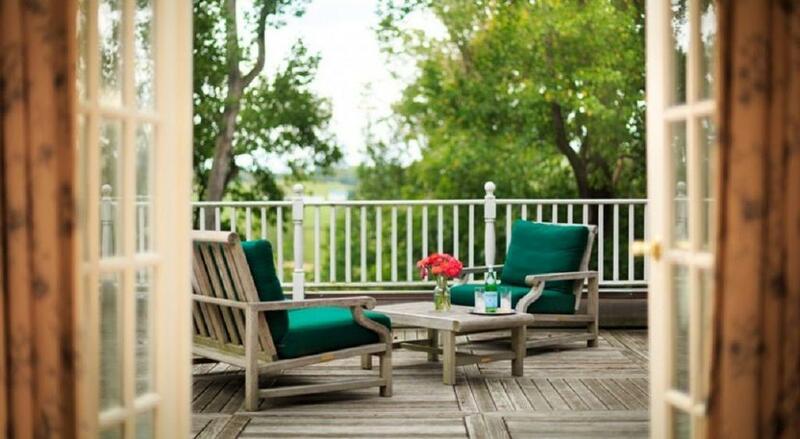 The Hayloft’s private and expansive roof deck is a perfect location to view sunrises over Goose Creek at our romantic country inn. 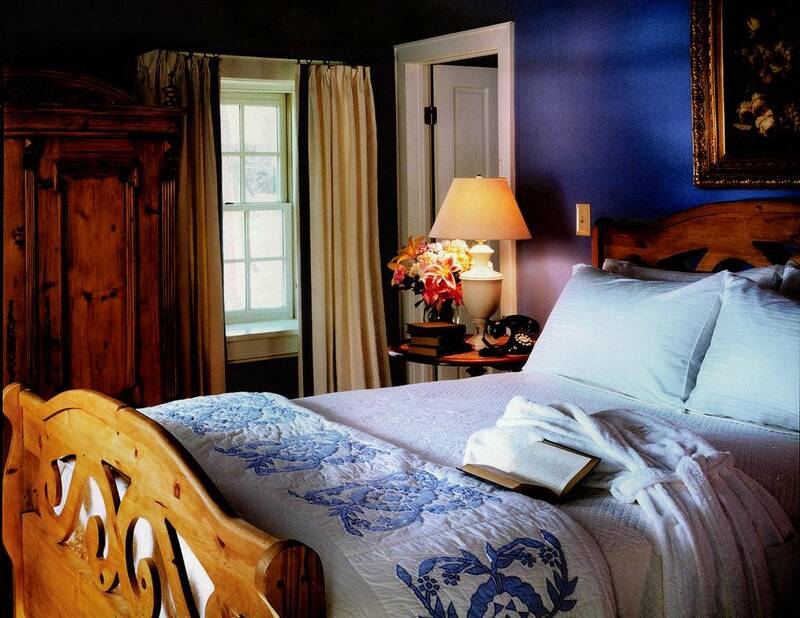 The Magnolia Room at our Virginia bed and breakfast boasts a French Country-inspired palette with elegant draperies, furnishings and accessories. 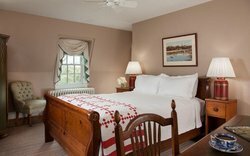 Located on the second floor of the Dutch Cottage, this charming guest room features a plush queen-sized sleigh bed, flat screen TV/DVD and lovely bath with over-sized claw foot tub and shower. 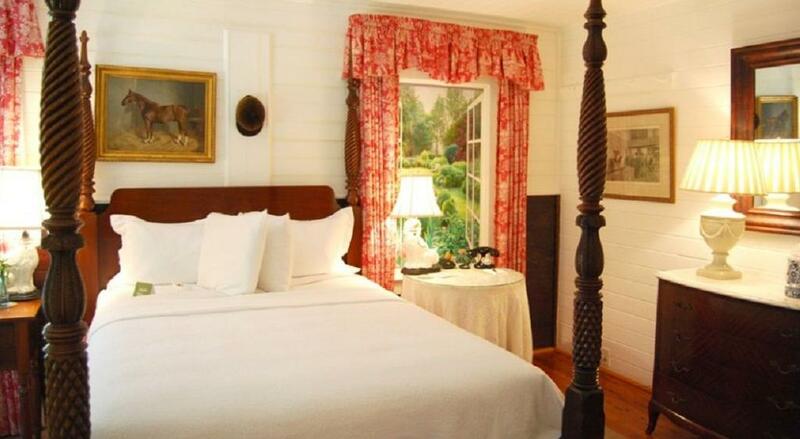 Dormer windows frame the exquisite views of Goose Creek and capture the essence of our romantic Virginia country inn. 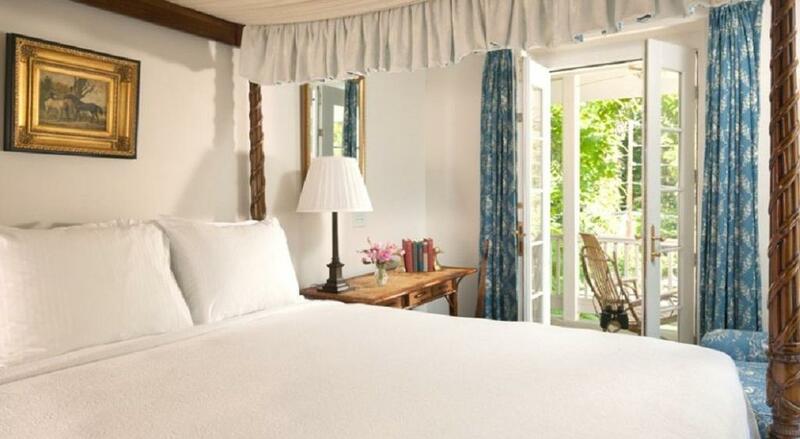 This romantic guest room is located on the second floor of the Dutch Cottage. 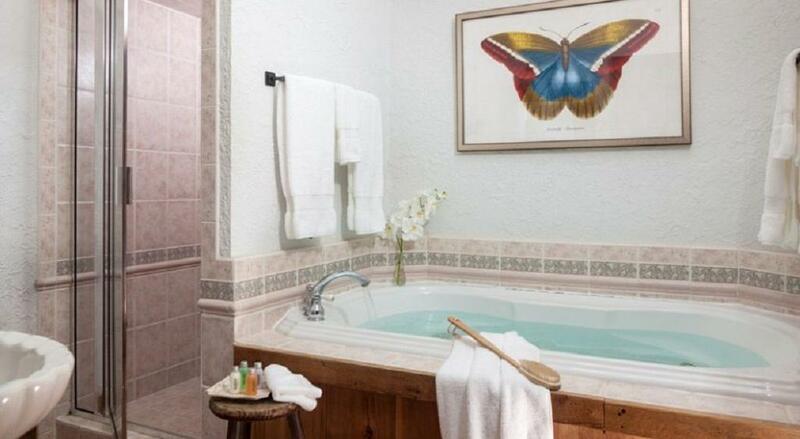 The Delphinium Room features a blue English Country color palette, carved-pine queen-sized bed and bath with jetted soaking tub and shower combination. 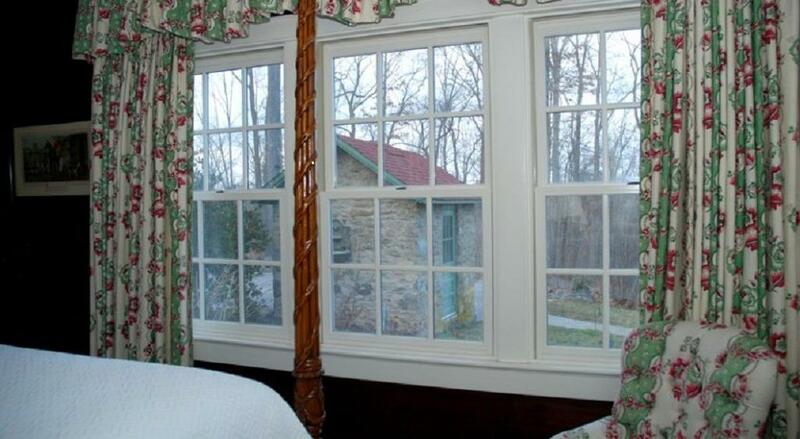 Dormer windows offer panoramic views of our luxury Virginia luxury B&B. 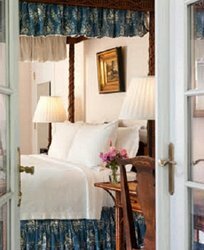 This bright and spacious guest room in the French Farm Cottage is decorated in traditional French Country flair with a vivid pastoral toile headboard, matching accessories and floor-length drapes. Goodstone’s Harvest Room features a plush queen-sized bed, elegantly hand-carved armoire, flat screen TV/DVD and bath with jetted soaking tub and separate shower. 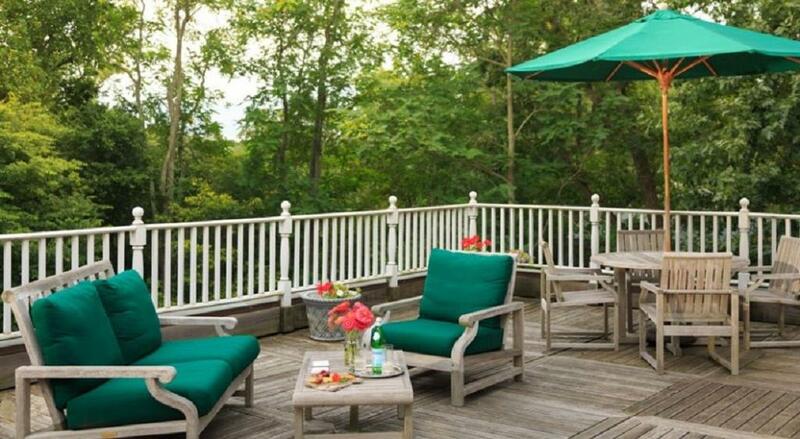 Relax on the patio with a glass of iced tea and enjoy panoramic views of the abundant gardens and rolling countryside at our Virginia country inn. 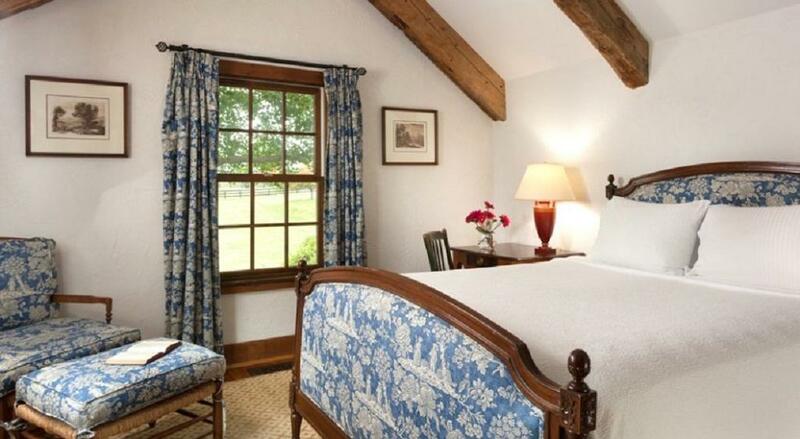 Set in the French Farm Cottage at our Virginia country inn, the Leith Room boasts a crisp blue and white country décor with its queen-sized bed, hand-carved antiques, cathedral ceilings with charming wooden beams and flat screen TV/DVD. 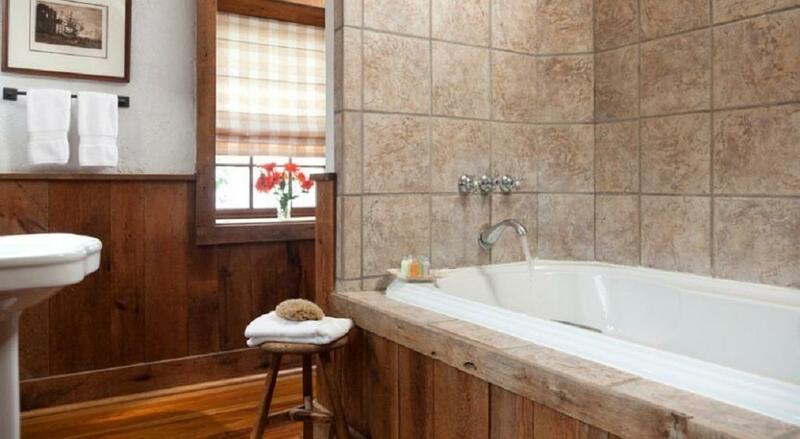 The luxury bath features a jetted soaking tub and shower accented with wood and designer tile. 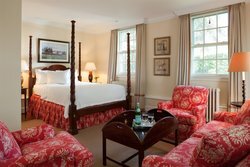 The Leith Room overlooks the cottage’s rear gardens, and is a perfect Washington, D C retreat for a romantic Virginia getaway! 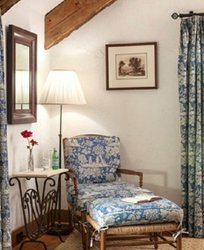 This inviting corner guest room in the French Farm Cottage features stunning blue and white toile accents and elegantly hand-carved furniture. 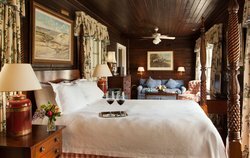 With its cathedral ceilings and country wooden beams, the Angus Room offers a queen-sized bed, flat screen TV/DVD and bath with an over-sized jetted soaking tub and separate shower. 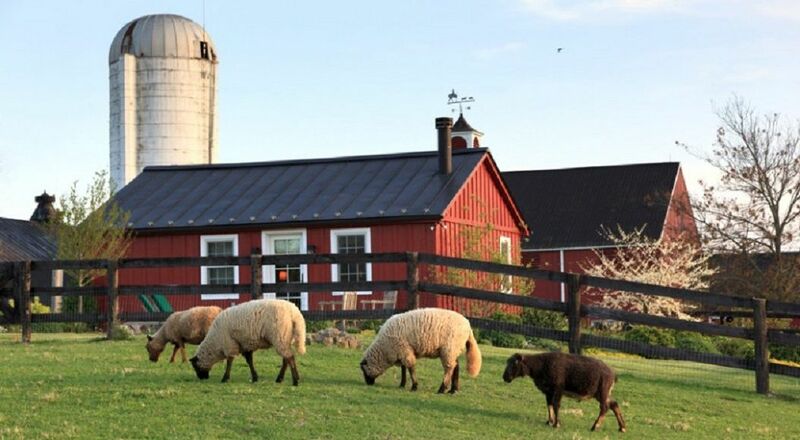 Enjoy views of the working farmstead and 265-acre Northern Virginia country estate from this charming Washington, DC area inn and spa. 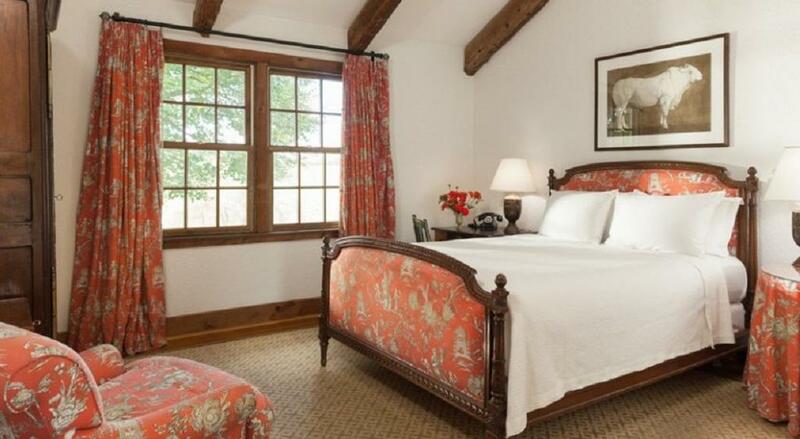 Located on the main level of the historic Manor House, this exquisite two-room suite has a private driveway entrance and lovely outdoor terrace. The handsome cream-colored bedroom with stunning red accents features a four-poster queen-sized bed and sitting area, with sofa with a full size sofa bed and armchairs. 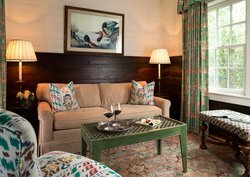 The Stuart Suite’s spacious sitting room offers a comfortable sofa with twin size sofa bed, TV area with large flat screen TV/DVD, and table and chairs that beckon for a game of cards. 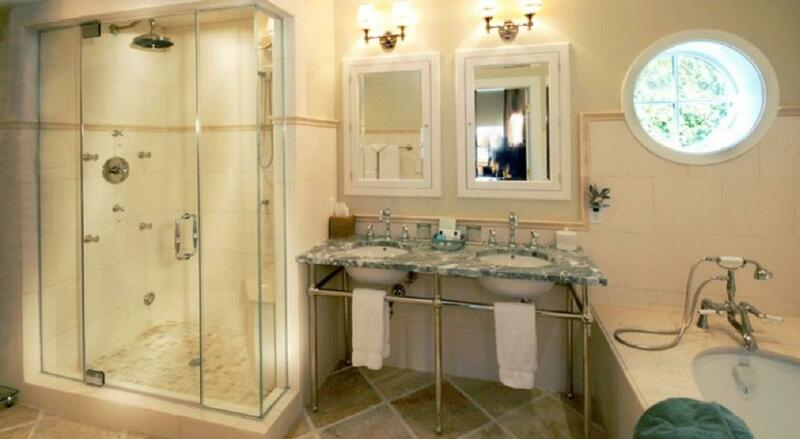 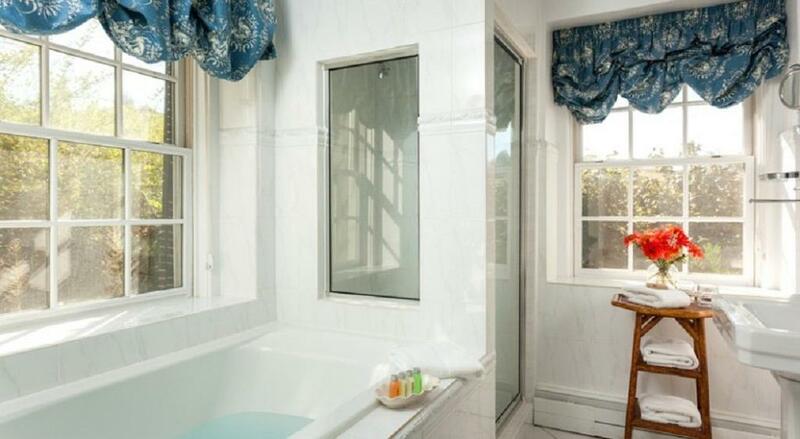 The spacious, marbled bathroom features elegant twin sinks, over-sized jetted soaking tub and separate shower. 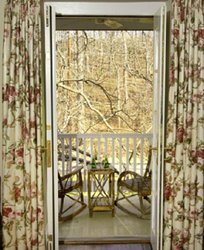 Enjoy a panoramic view of the Blue Ridge Mountains from the Stuart Suite’s private terrace at our Virgina bed and breakfast. 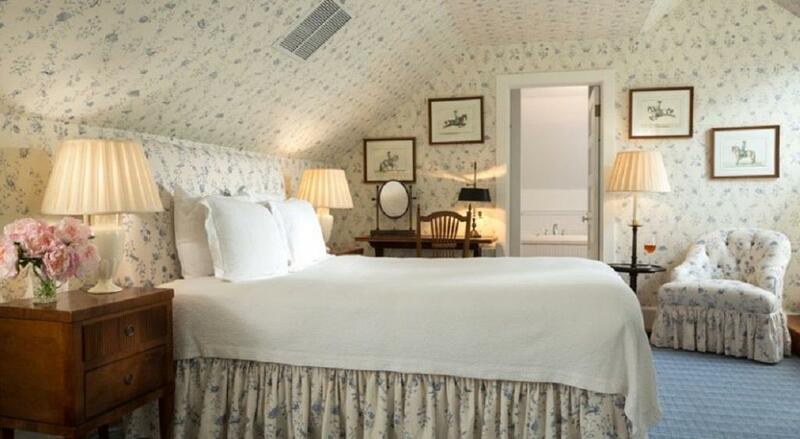 Please call the inn directly at 540-687-3333 to book the Stuart Suite. 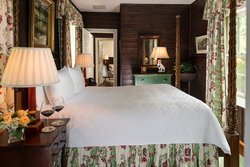 Located on the second floor of the Manor House, the Harriman Room will warmly embrace you after a long day in Virginia wine and hunt country. 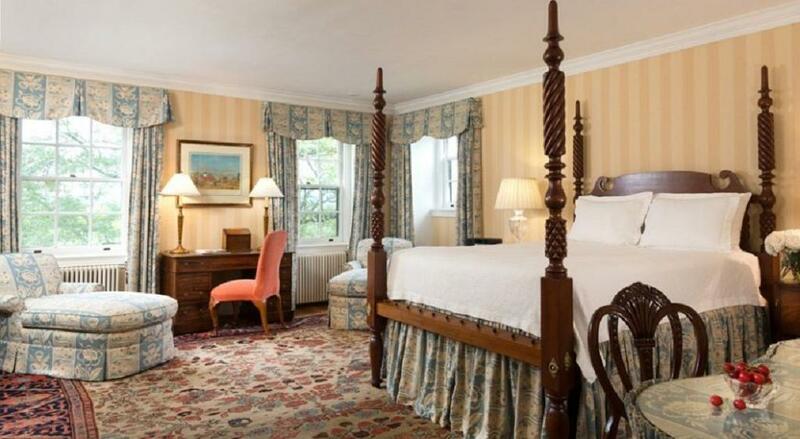 Beautifully decorated in rich salmon tones, the elegant room features a queen-sized four-poster bed, antique vanity dressing table, flat screen TV/DVD, original bath with step-in tub and shower, and a reading chair perfectly positioned to appreciate the beauty of our Virginia country inn and surroundings. 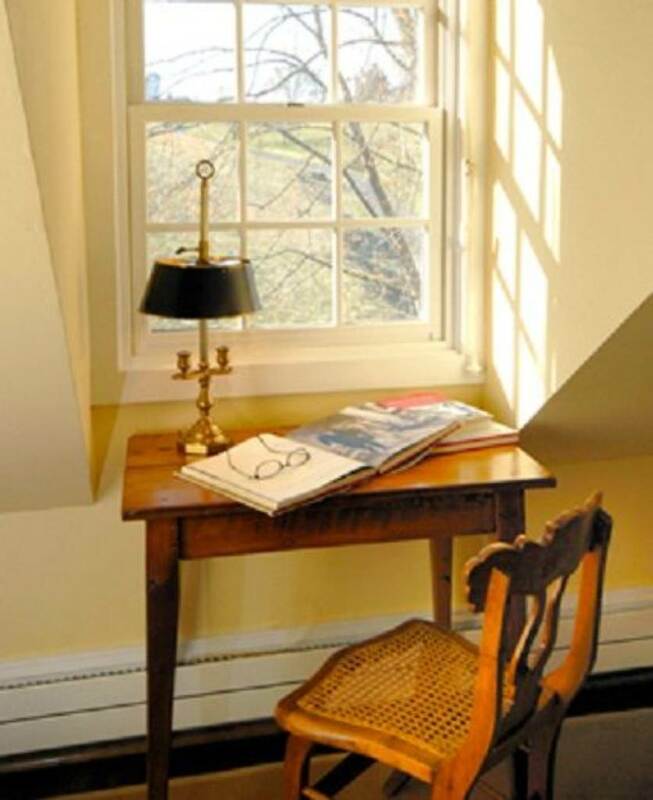 Please call Goodstone directly at 540-687-3333 to book the Harriman Room. 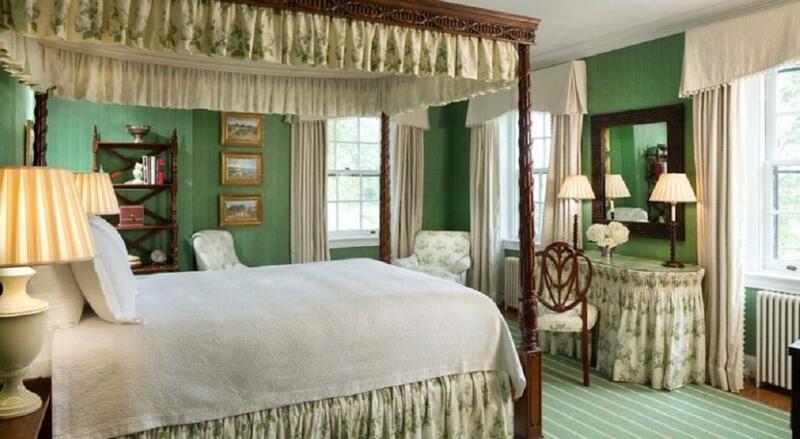 This bright and romantic bedroom on the second floor of the Manor House is a paradise of Kelly green with its elegant four-poster canopy bed, comfortable reading chair with ottoman, flat screen TV/DVD and charming make-up vanity table reminiscent of the 18th Century and a series of elegant oil paintings depicting the scenic countryside. 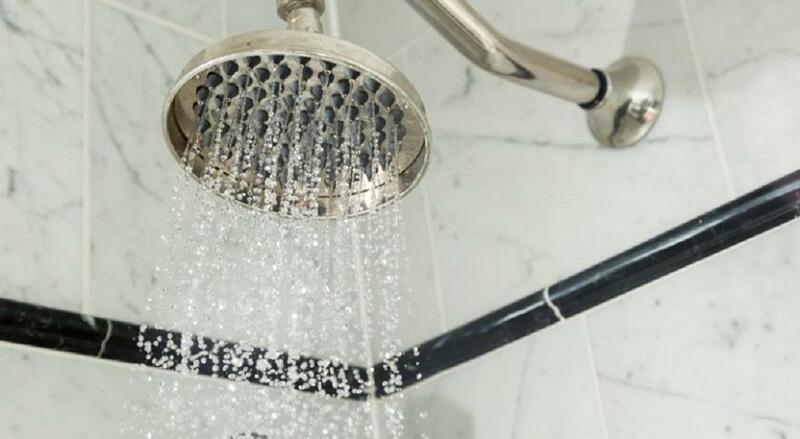 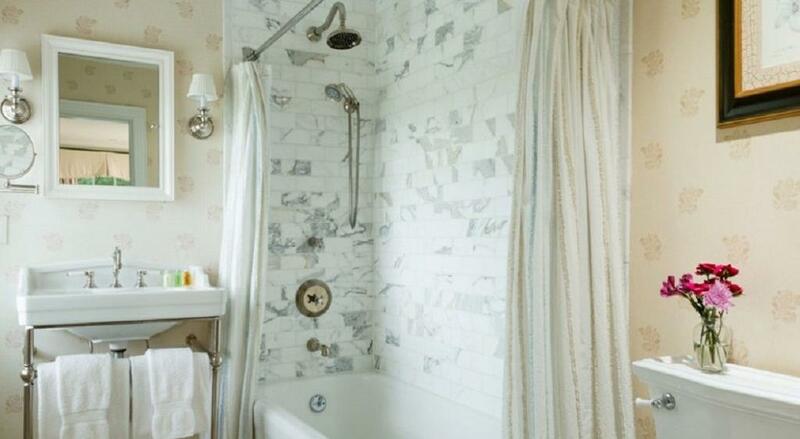 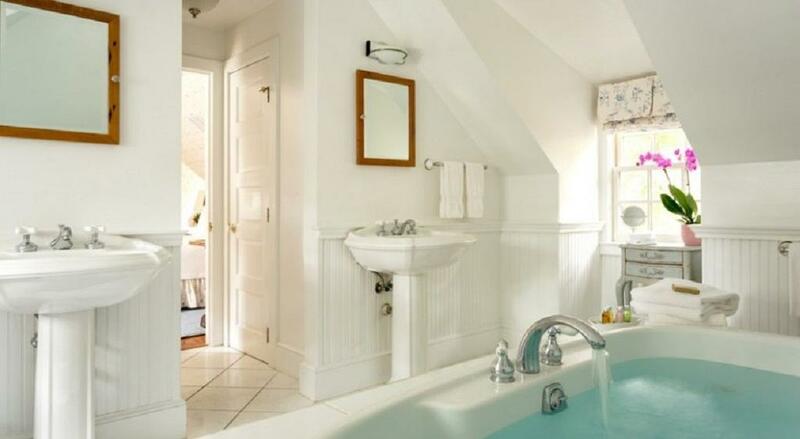 The charming bath features a jetted soaking tub and rain shower for a softer shower experience. 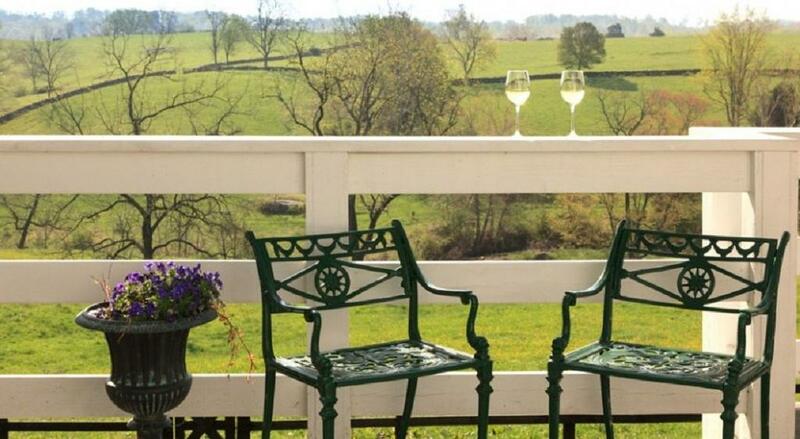 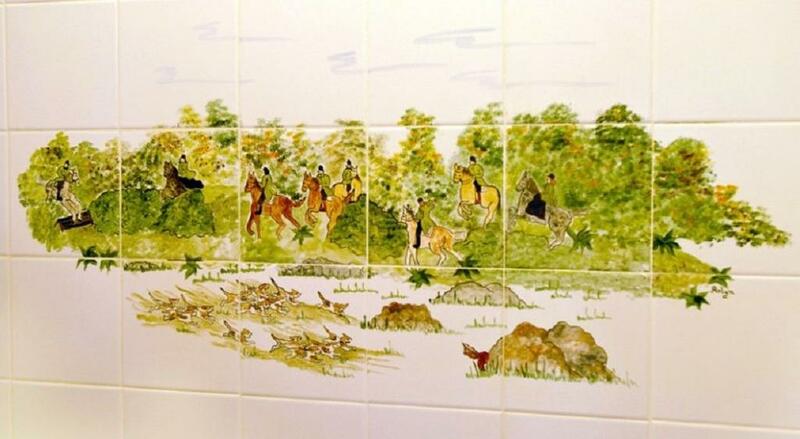 Enjoy splendid views of the scenic Virginia wine country and our Virginia horse country from the Mosby Room windows. 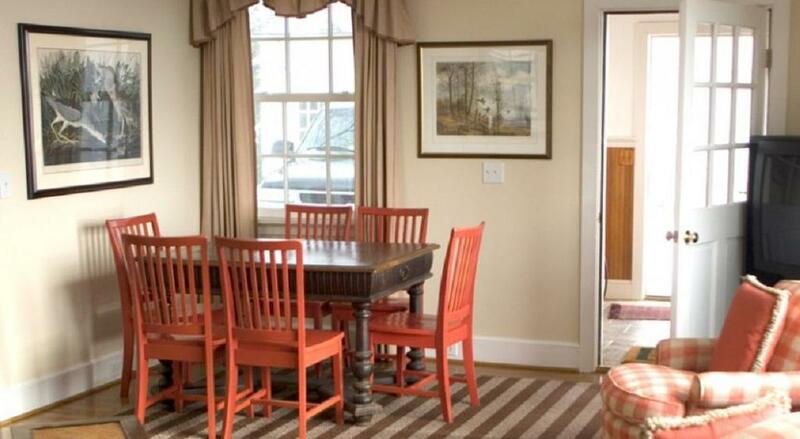 Please call the inn directly at 540-687-3333 to book the Mosby Room. 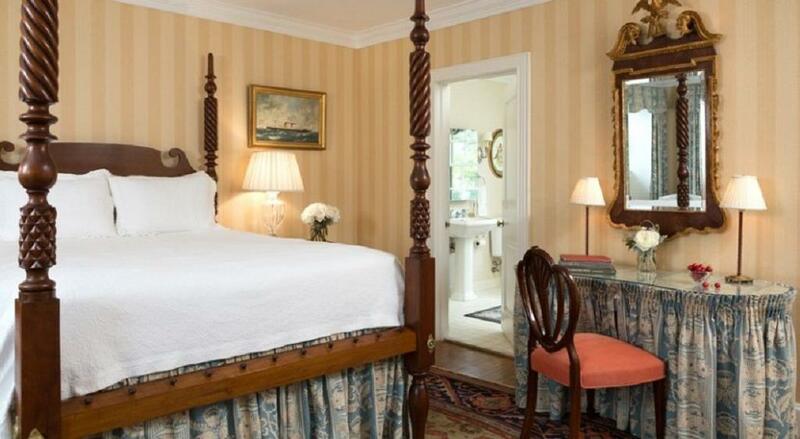 The plush king-sized bed is the focal point of the elegant Master Room located on the second floor of the Manor House. A cozy sitting area with lounge chairs and flat screen TV/DVD invites you to relax with a drink and view the rolling Virginia landscape through your suite’s windows. 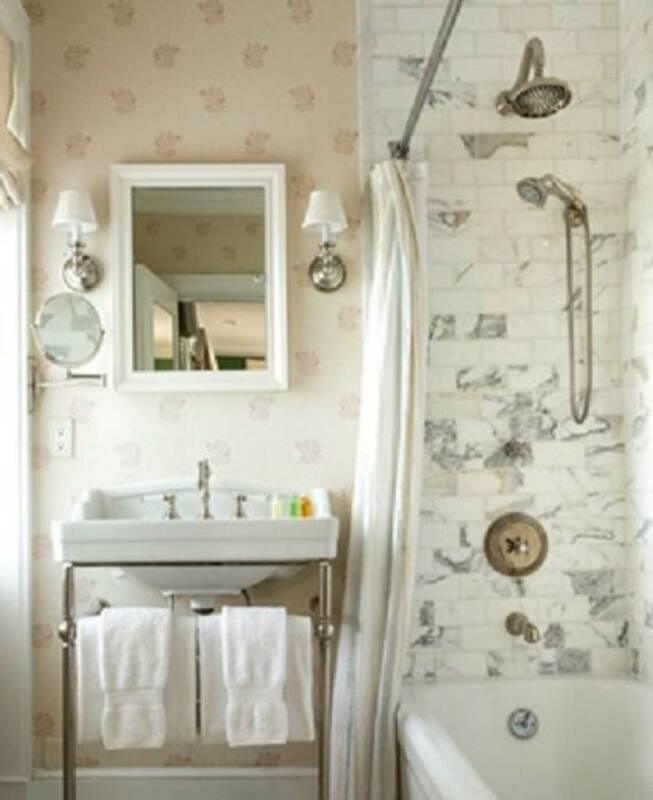 The Master Room’s over-sized bath features a jetted soaking tub and separate walk-in shower, pedestal sink, balloon valances and original bathroom tiling. 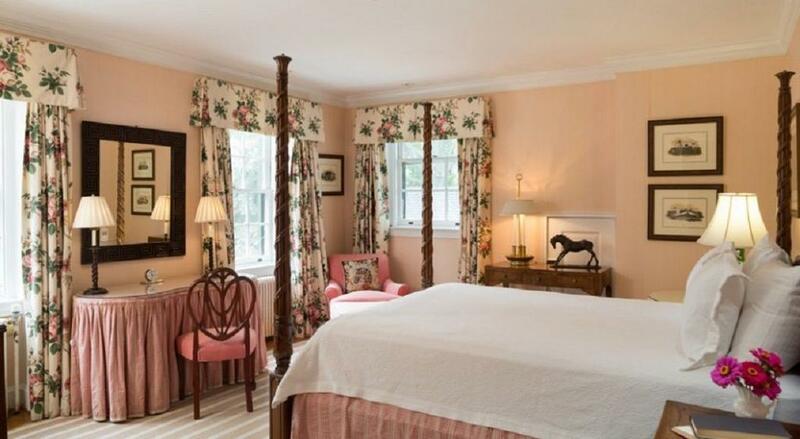 Once you step into this gorgeous guest room, you may never want to leave our Middleburg country inn! Please call the inn directly at 540-687-3333 to book the Master Room. 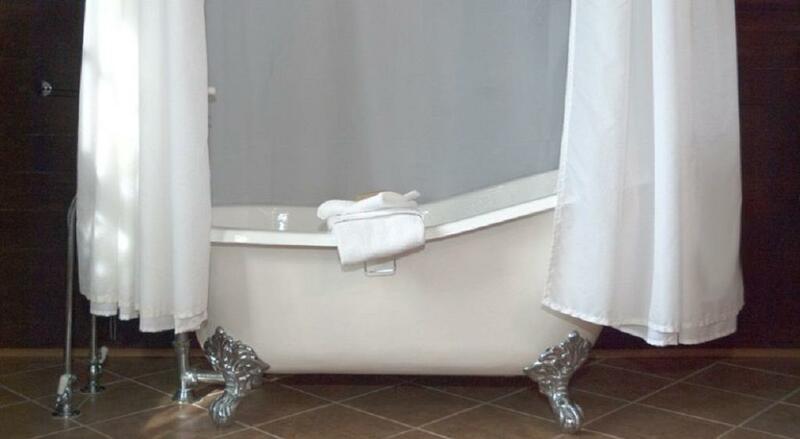 Enjoy an over-sized bath that features a jetted soaking tub and separate walk-in shower, pedestal sink, balloon valances and original bathroom tiling. 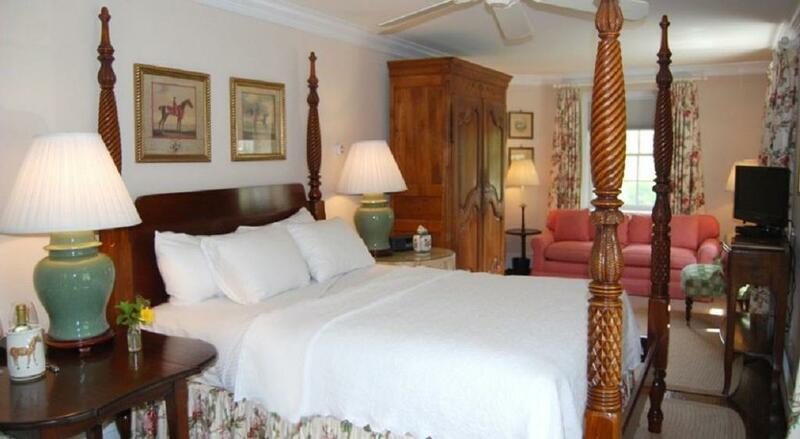 Once you step into any gorgeous guest room, you may never want to leave our Middleburg country inn! Decorated with charming blue toile fabric, the queen-sized four-poster canopy bed is the centerpiece of the Verandah Room on the second floor of the Spring House. 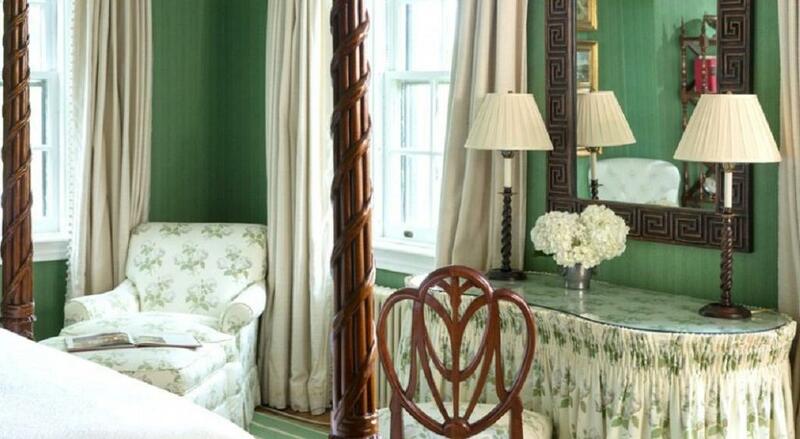 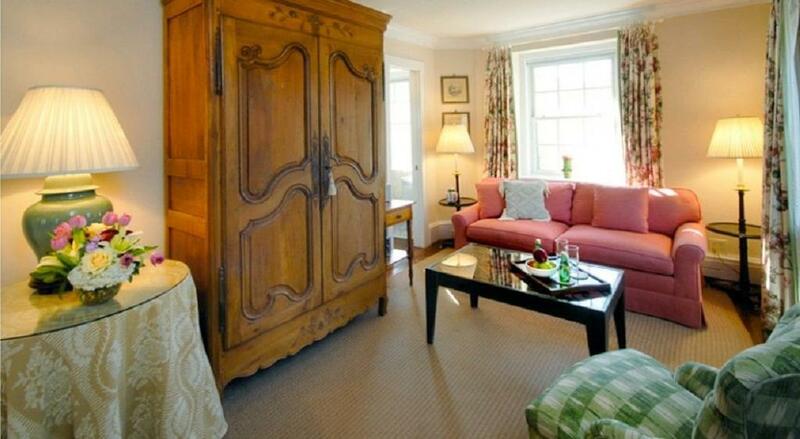 An antique, hand-carved armoire adds to the elegance of this exceptionally comfortable accommodation. 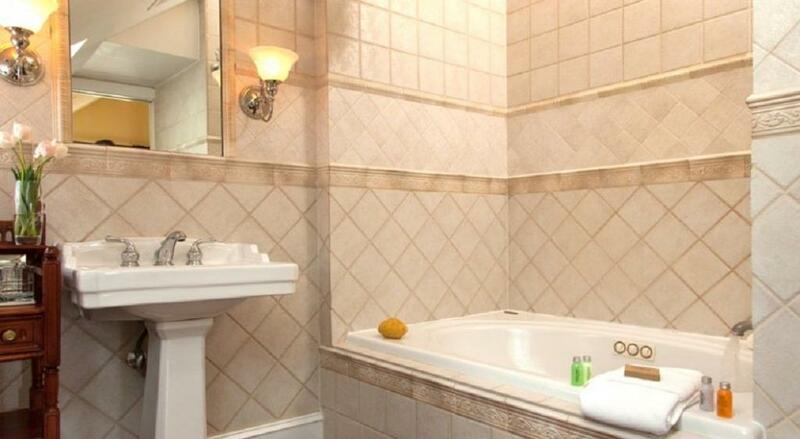 Our guest room offers a flat screen TV/DVD and the bath features an oversized jetted soaking tub and separate shower. 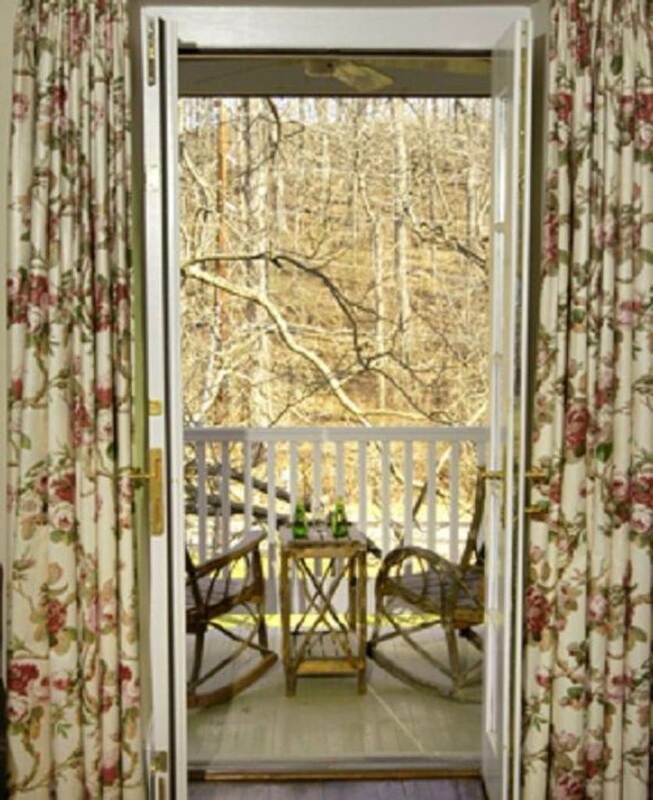 French doors lead from the bedchamber directly out onto the second-story verandah of our Virginia bed and breakfast. 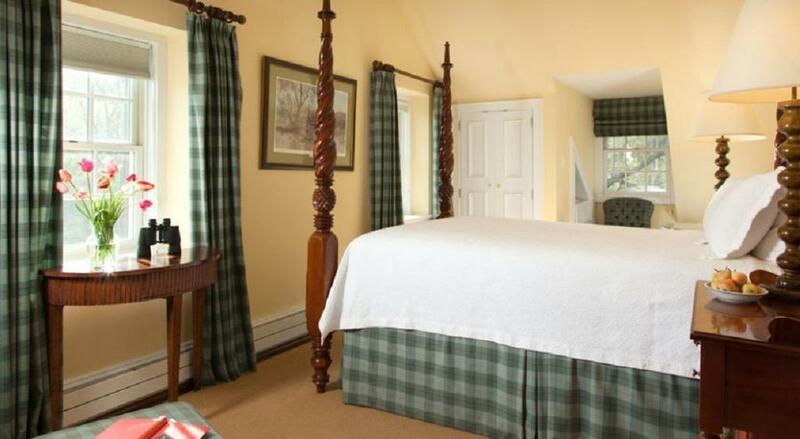 With green and rose country décor and a queen-sized four-poster bed, the Warburg Junior Suite is so comfortable you might want to stay at our Virginia B&B forever! 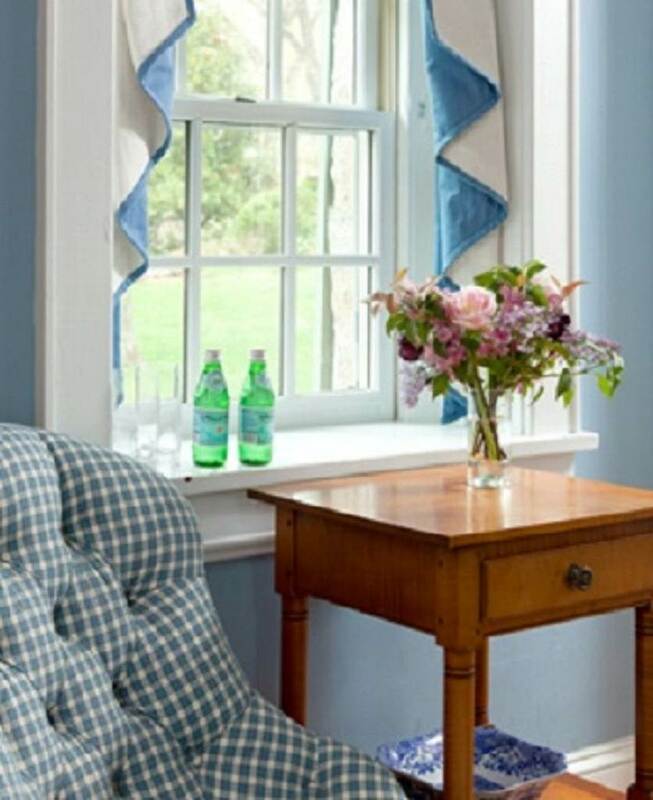 Located on the second floor of the Spring House, this suite features a lovely sitting parlor with sleeper sofa, flat screen TV/DVD, stereo and CD player. 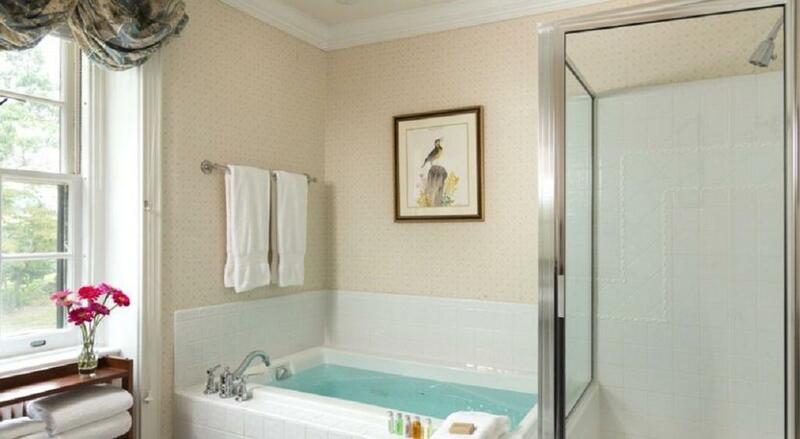 The stylish bathroom features a jetted soaking tub. 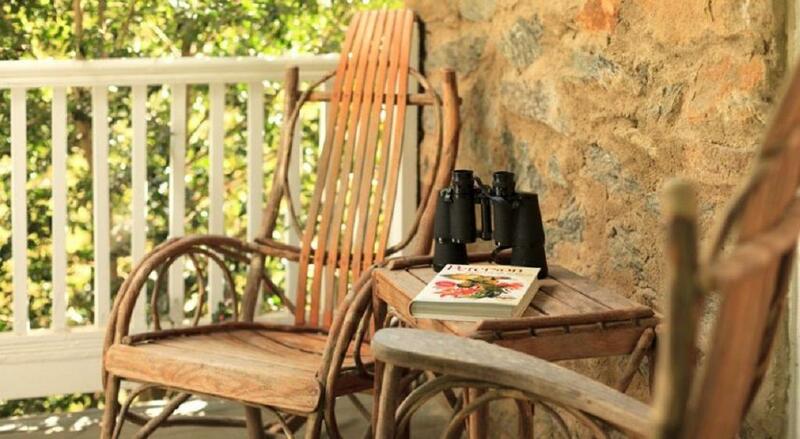 Step out onto the front porch via French doors and relax with a cup of tea and great book. 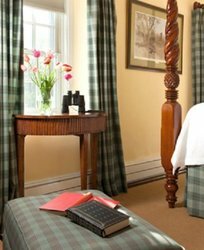 With its Old World architectural elements, the stately Ambassador Room at our Virginia bed and breakfast is decorated in crisp yellow tones and accented with a regal tartan plaid. 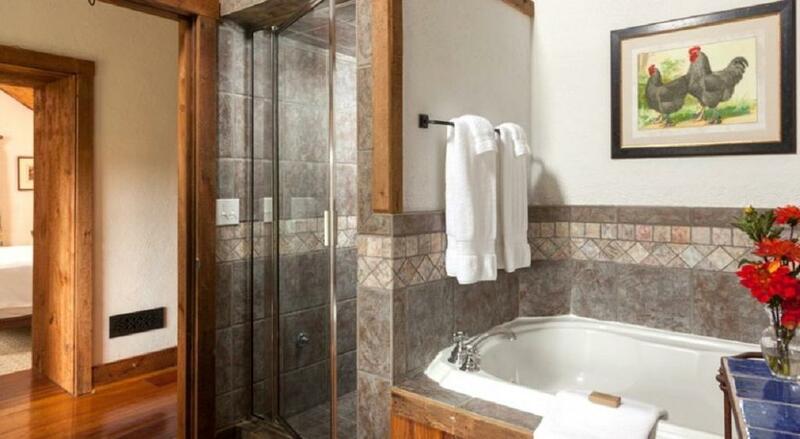 Located on the upper level of the Spring House, the room offers a flat screen TV/DVD and grand bath with over-sized jetted soaking tub and shower combination. 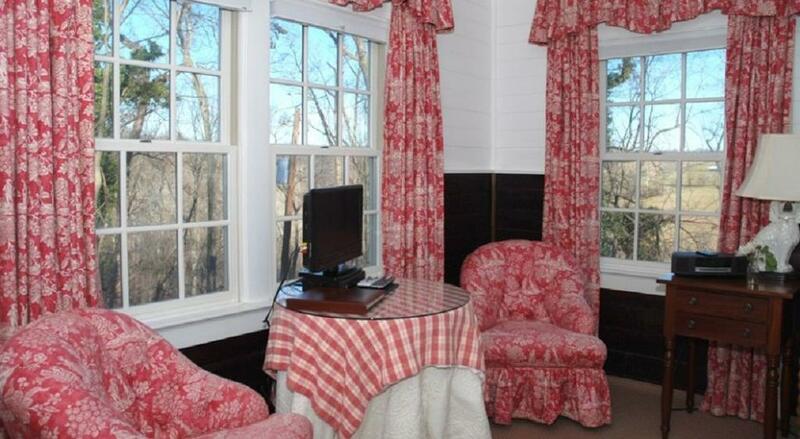 Enjoy panoramic views of the Goodstone estate from the dormer windows of this delightful hideaway. 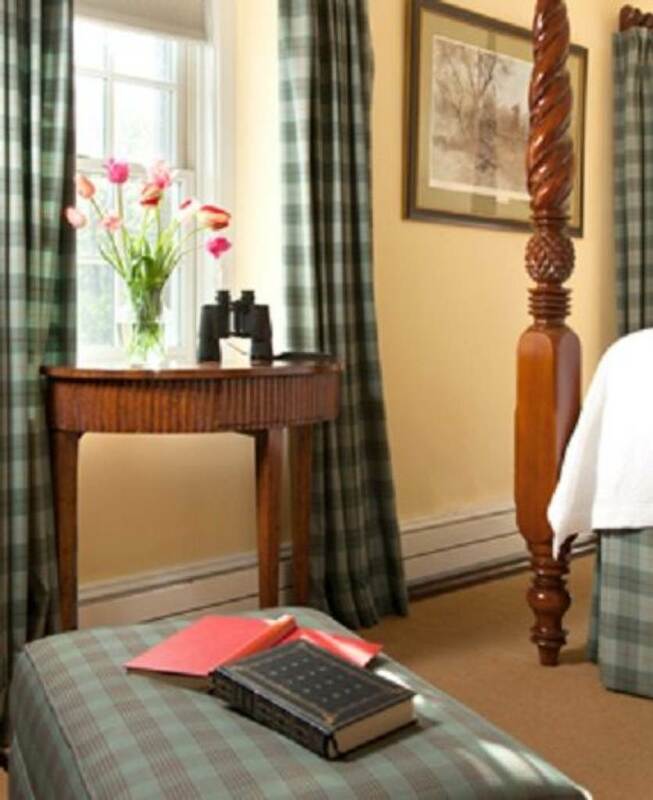 With rich accents of blue and gray-tartan plaid, the Goodwin Room is located on the upper level of the Spring House. 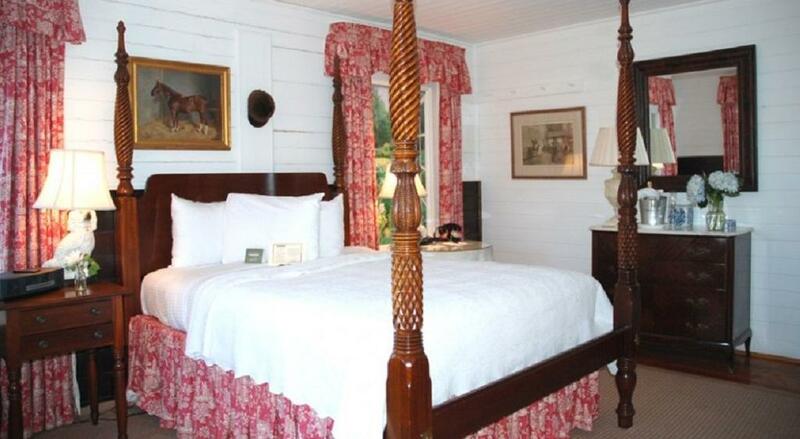 This impressive room features a cherry queen-sized four-poster bed and flat screen TV/DVD. 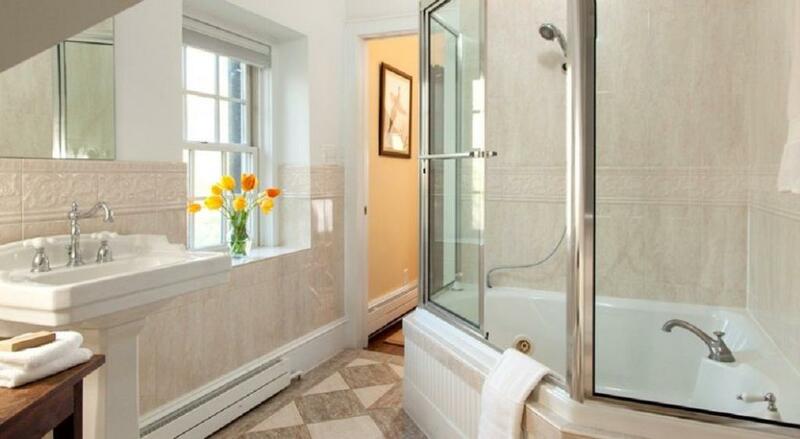 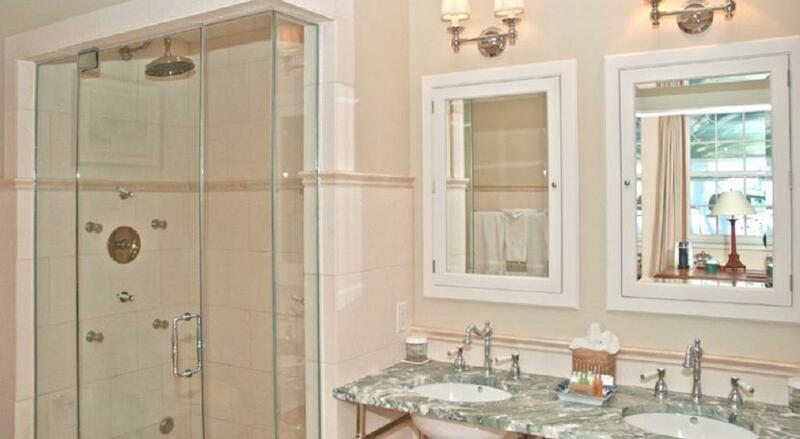 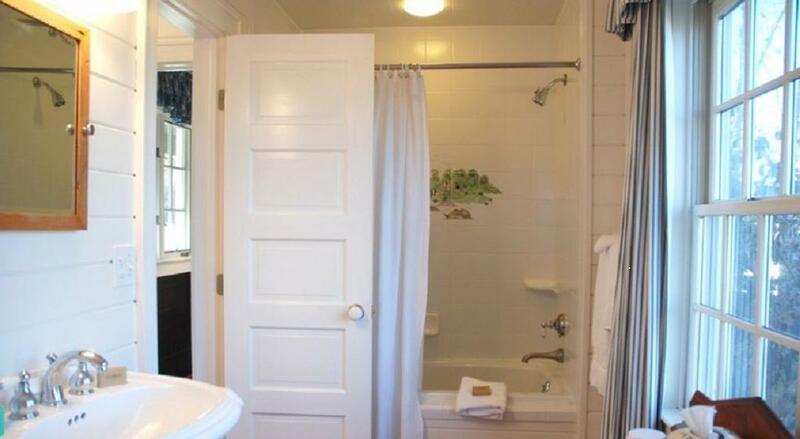 The spacious bathroom boasts a fabulous jetted soaking tub and shower combination. 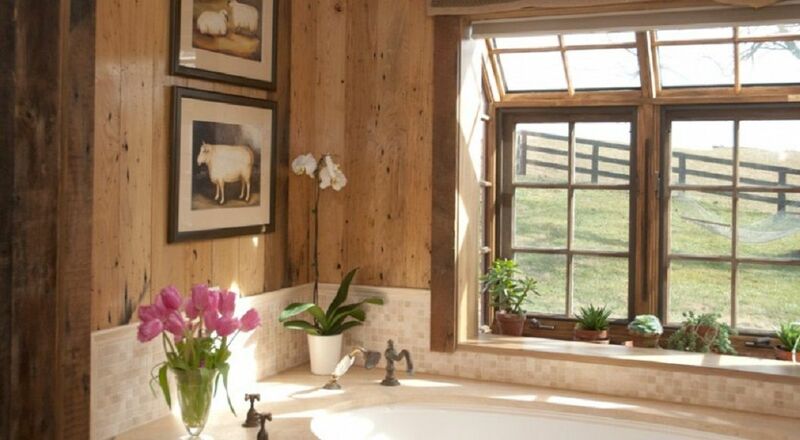 Skylights and dormer windows ensure natural light will cover every inch of your Middleburg inn retreat. 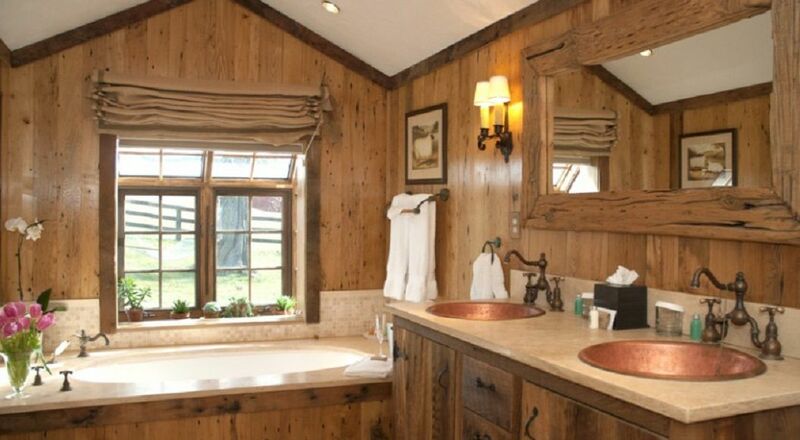 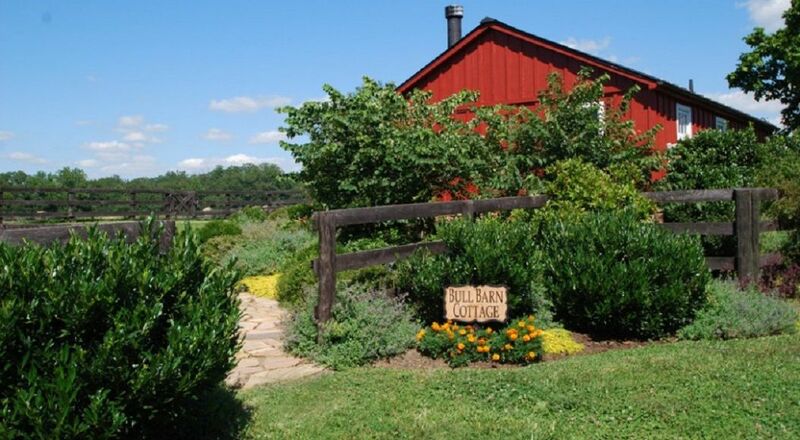 With its unique restoration, the stand-alone Bull Barn Cottage is the most private luxury guest residence at our Virginia bed and breakfast. 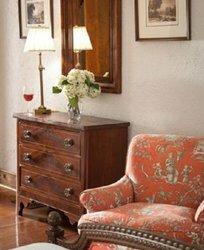 The two-part, elegant country sitting room and library feature vaulted ceilings with rough hewn wooden beams and a wood burning stone fireplace that celebrates a time past. 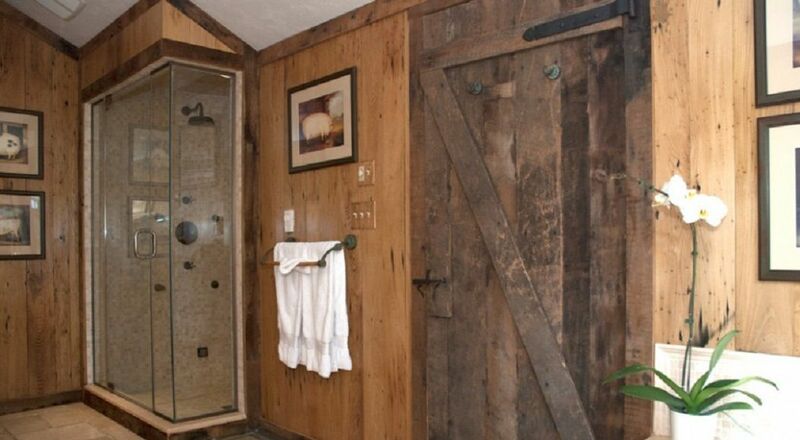 The wrought iron accents are the original bullpen ironworks preserved in the renovation. 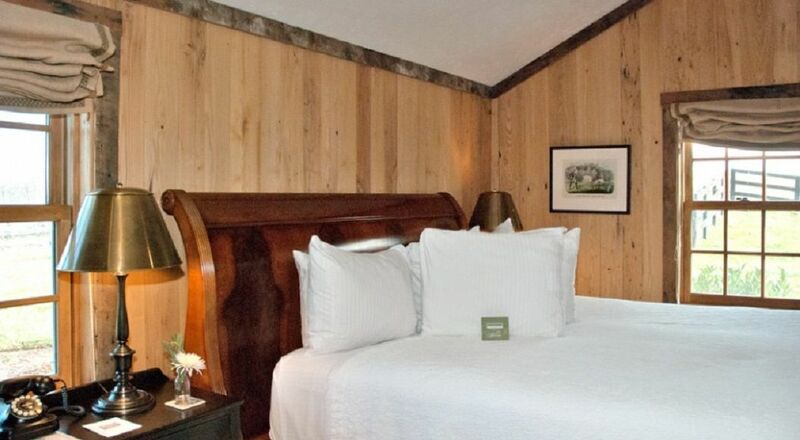 The Bull Barn’s charming bedroom offers a plush king-sized sleigh bed for the utmost in comfort along with a flat screen TV/DVD. 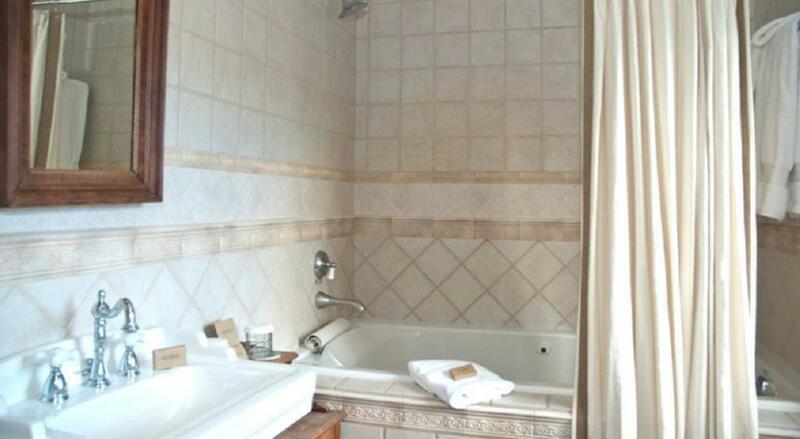 With dual copper sinks, the lavish bath boasts a jetted soaking tub with picture window, a multi-jetted steam shower with seat and heated ceramic tile flooring.